I wanted to do a small update on weekly progress regarding Darkest Night. The inventory is a simple function right now, you can equip items(hold them in your hand), which is efficient for a weapon or lantern to light your surroundings. Your inventory consists of "Item Holders", these light-gray boxes you can see in the screenshots. Depending on your clothes and backpack, the quantity of these "Item Holders" change. For example, if you have a tiny backpack, you might only have 10 inventory space/slots to scavenge and store items in. However if you have a large backpack and good clothes, you might even have 30 slots. This mechanic adds more progression to the game, and its good for the player to set up goals, regarding their item storage. 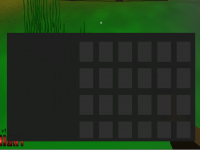 In the inventory, you can right-click on any "Item Holder" and get options about what to do with that specific item. You will also be able to see the durability of each item, but durability is something I will bring up in a future update and is something I'm currently working on. The inventory is "dynamic", and easily changeable inside programming, which means it won't pressure the server as much. The blood effect as you may see is simple, but it does represent damage to your enemies. Since Darkest Night is designed low poly, I want everything to match along with the design, so making the blood effect look low poly was important for me. It's not completely done, it might just be a placeholder as of now. But I will add some random elements to the effect, for example how much blood it emits depending on body part and such. Thanks for supporting Darkest Night !